Once upon a time, Italian nonnas made pasta by hand, with rolling pins or wine bottles and without the aid of a pasta machine. They made pesto without a food processor too, pounding basil to a pulp with mortar and pestle. I wouldn’t do that either of these things. These are two of the very few examples I can think of where tools or technology really made way for me to us to experience particular foods, made at home and from scratch, on a fairly regular basis. Plus I’ve never had a pesto as fresh or as suited to my taste du jour as one made at home, and the same is true for pasta. Pasta made fresh at home is as fresh as you will probably ever have it and as customizable as you could want. I like mine heavy with egg yolks and saffron for the sheer luxury of it, but you can make yours green with spinach, or earthy with the water from reconstituted porcini mushrooms. Rolling it through a pasta machine, with settings to guide you, makes fresh pasta very accessible and tasting it makes it very addictive. Dried pasta (good dried pasta) is fine for the everynight dinners. 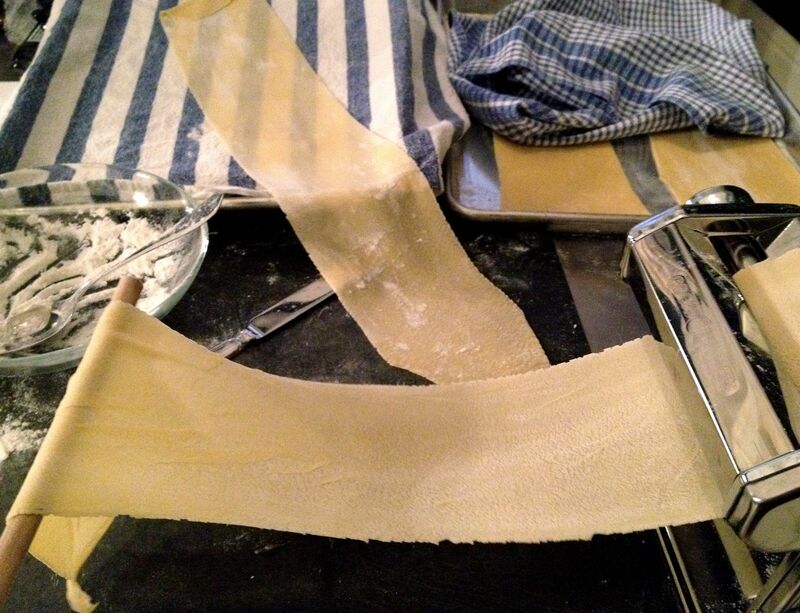 Fresh pasta is a weekend thing: stop, make something real, cry with gratitude. Or if you’re less dramatic or have had less wine than me, simply marvel in your awesome self and the most awesome thing you’ve made all week. Who else would I turn to for this fresh pasta installment of “weekend class” than the person whose show I’m glued to during Saturday morning’s PBS cooking block? I was gifted Lidia’s book and this was the one of the very first things I made from it. Those pages are destined to be the ones caked with cooking, that fall open to their spot every time they’re needed, for decades down the road. LS note: In Lidia’s cookbooks, she provides proportions for simpler and richer (more egg yolks!) pastas. See the bottom of the recipe for those. To mix the dough: Put the flour in the bowl of the food processor and process for a few seconds to aerate. Mix with a fork the whole eggs and egg yolks, olive oil; and 1/4 cup ice water in a small bowl until just blended. Turn the dough out on a lightly floured surface and knead it by hand for a minute until it’s smooth, soft and stretchy. Press it into a disk, wrap well in plastic wrap and let it rest at room temperature for a half hour. To roll out the dough in a pasta machine: Cut the pound of dough into 4 equal pieces. Work with one at a time and keep the others covered. Run the first piece of dough through the rollers at the widest setting several times to develop strength and smoothness. Repeat with all the pieces. Re-set the machine to a narrower setting and run the first piece through extending it into a rectangular strip. Let the rollers move the dough and catch it in your hand as it comes out. Roll it again to stretch and widen it. Lightly flour and cover the strip, then stretch the other pieces. Roll and stretch all the pieces at progressively narrower settings, until they spread as wide as the rollers (usually about 5-inches) and stretch to 20-inches or longer. Cut the 4 long pasta strips in half crosswise, giving you 8 sheets, each about a foot long and 5-inches wide. Lay these flat on the trays in layers, lightly floured, separated and covered by towels. To cut pappardelle: Lay out a rolled sheet on the floured board; dust the top with flour. Starting at one of the short ends, fold the sheet over on itself in thirds or quarters, creating a small rectangle with 3 or 4 layers of pasta. With a sharp knife, cut cleanly through the folded dough crosswise, in 2-inch wide strips. Separate and unfold the strips, shaking them into long noodles. Sprinkle them liberally with flour so they don’t stick together. Fold, cut and unfurl all the rolled pasta sheets this way, and spread them out on a floured tray. Leave them uncovered, to air-dry at room temperature, until ready to cook. I have several of Lidia’s cookbooks in which he uses the same technique to make richer or “poorer” pastas (where the ratio of eggs, the most expensive ingredient, is smaller). They create enjoyable pastas of different textures so I’ve included them below. She also makes some important notes in the book that I’ll summarize here: richer pasta quick faster but all fresh pastas cook quickly in just over 2 minutes; fresh pastas are not cooked to al dente like dry pasta, rather, cook them all the way through and taste to test them as some will be done by the time they float to the top and some won’t, some shapes cook quicker than others. All recipes yield 1 pound of dough.